The former politician and Olympic athlete says Australia is up for change and the government needs to show the way. 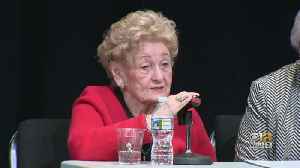 Six million Jews were killed by the Nazis and their collaborators during the Holocaust, including Cipora Feivlovich's grandfather, parents, brother and best friends. ▶ Videos for "Remembrance Day"
John Carroll High School in Bel Air hosted its annual Holocaust remembrance day. The joint state and council project to restore Anzac Square is nearing completion after several months' delay. A car allegedly swerved towards the officer near a Remembrance Day ceremony at St Leonards Park. An estimated 10,000 people honoured those who have paid the ultimate price in service to our nation at the Shrine of Remembrance in Melbourne. Remembrance Day services across Australia today. A crowd of about 12,000 gathered outside the Australian War Memorial on Sunday for the Remembrance Day ceremony. The Remembrance Day national ceremony outside the Australian War Memorial in Canberra. Prime Minister Scott Morrison has spoken of the 'deep scars of war' as Australians around the nation and world mark Remembrance Day. Retired Lieutenant-Colonel Anthony John said this Remembrance Day will have added significance. Every year, the dwindling number of veterans of other wars march to the memorial in Gisborne. My father, who was in the Korean War, was one of them. Despite repair work being done, Big Ben will strike to mark the centenary of the Armistice on Remembrance Day in London. On November 11 we'll remember - but remember what exactly? On Remembrance Day, a female choir will hold an event to remember a group of women who tried to get peace before hostilities ended with German defeat. Australia's veterans and political leaders will gather around the country and the world on November 11 to mark 100 years since the end of the Great War. At the 11th hour, on the 11th day, of the 11th month, Australians around the country will pause to remember.